Our basic mountain bikes are great for riders looking for a durable multipurpose bike to ride on beginner mountain bike trails, dirt roads, bike paths, or just around town. 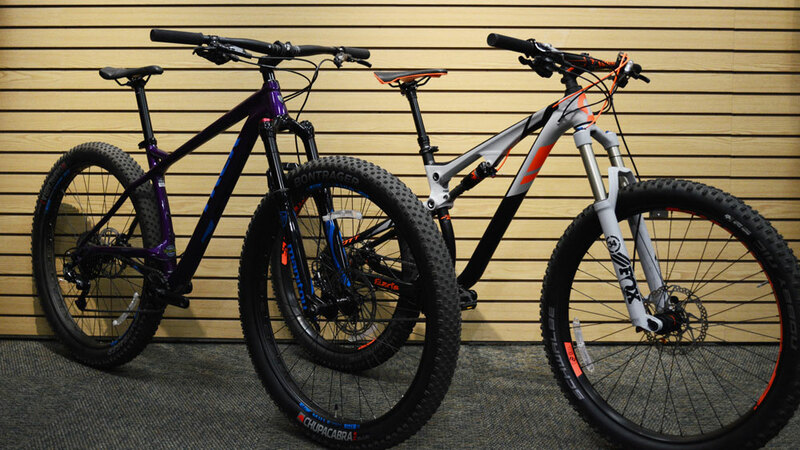 We carry the Trek 820, Trek Marlin, Giant Revel, and Scott Aspect. Whether you're looking for a hardtail or full suspension, ultimate speed or confident handling, we've got you covered. We carry a diverse range of cross country and trail bikes to fit most styles of riding. We carry the Trek Fuel EX, Trek Superfly, Scott Spark, Scott Scale, Giant Anthem SX, and Giant Stance. For women's specific models, we carry the Trek Fuel EX 8, Trek Superfly, Trek Cali, Scott Scale, Liv Lust, and Liv Tempt. Like to climb to the top and come back down even faster? Innovations in frame geometry and suspension technology have allowed for true "quiver killers". Go on a 40 mile epic on Saturday and session the bikepark on Sunday. We carry the Trek Slash, Trek Remedy EX, Scott Genius, and Giant Trance. Plus bikes are are often called mid fats, and that is because their 2.8-3.0 inch tire width strikes a balance between standard mountain bike tires and those of a fat bike. This offers extreme traction and stability for trail riding combined with the quick handling associated with a normal mountain bike. Big tires = big fun. We carry the Trek Stache and Scott Scale Plus. Keep riding all winter long with a fat bike. Fat bikes aren't just fun in the snow though! Many riders use fat bikes to ride on the beach or even as their primary trail bike. The massive tires up to 5 inches wide give nearly unlimited traction and inspire confidence in any conditions. If big tires = big fun, then even bigger tires = even bigger fun, right? We carry the Trek Farley in both hardtail and full suspension varieties.